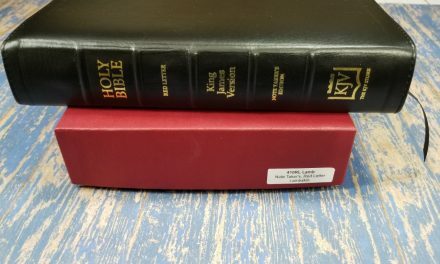 I’ve been a BibleWorks user for a while. It’s the app I use in all of my writing. 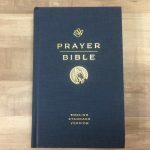 All of the Scriptures printed in my books, my personal studies, my sermon prep, and my classroom prep were all taken from BibleWorks. It’s my go-to app for word studies, translation comparisons, and quick searches. You can imagine my excitement when I heard the news about BW10. I looked at BW9 primarily as a writer. My life has changed a lot since then. I’m looking at BW10 as a pastor. Info about the review – I’m breaking this review up into three components. This post will look at some of the new features and the Search Window. The next will look at the Browse Window, and the last will look at the Analysis Window. My review copy is an upgrade from BW9. You can even upgrade from BW6 if you want. You get upgraded modules for free when you upgrade. You can also buy the full version. The first thing I noticed is BW10 starts up faster than BW9 did. It starts in a small window. I immediately went through the settings and now it opens in a full window at 200% zoom. This looks perfect in my 17” laptop. The main layout is what I’m already used to but with a few new features. The most obvious is the new colors. There’s still three windows that can become four, but now some of the windows can be closed and components can be toggled on or off giving you a clean playing field to work with. BW looks better with every new edition and this is the best so far. Fuzzy Search – expands the types of words returned in the results. And lots more. There are also lots of updates to BW9 additions. You can see the complete list with details on their website, but I wanted to show that there’s enough new tools here to make it worth the upgrade. The tools I see me using the most often are the Fuzzy Search, EPUB Reader, and the User Lexicon. The last two will let me build my own library and notes that I can use for sermons and teaching classes (which is what I do the most). These are things that I’ve done separately, but with BW10 I can integrate more of my library and notes. 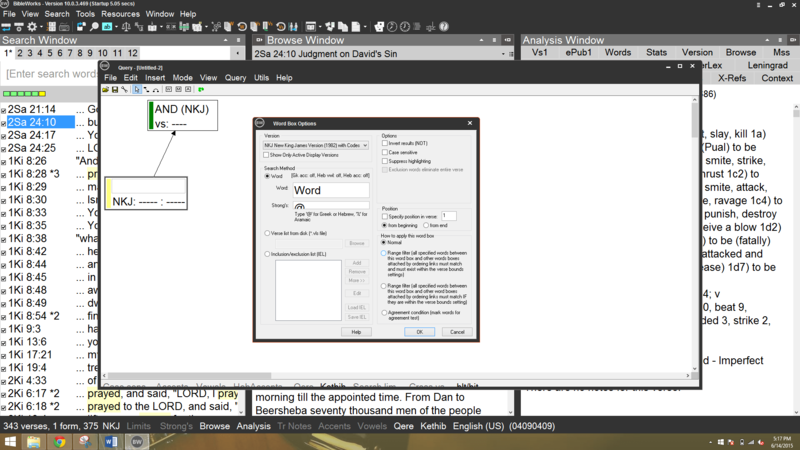 There are three sections in the layout: Search Window, Browse Window, and Analysis Window. 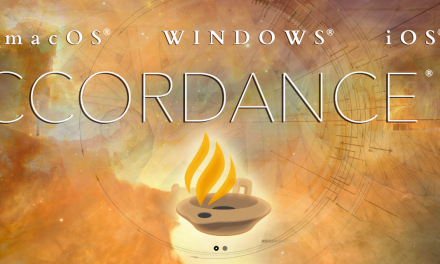 Each of the windows have features that can be toggled opened or closed, on or off. Let’s take a look at the window on the left – the Search Window. The search window has some extremely powerful search features. It can be a touch confusing at first because you don’t search just by typing what you want. You type different things to get different kinds of results. Clicking on any verse in the Search Window opens that verse in the Browse Window. Searching is easy to do but you have to learn the commands. It’s well worth it. There’s plenty of help in the built-in help file and the videos on YouTube. There are even workshops that give you hands-on training. There’s no shortage of training for BibleWorks. There are tabs so you can have multiple searches that you can pick from. You can choose your search version (including Greek and Hebrew) and have a different version to display the results. You can also set search limits. You can find related words, verses, or phrases. There’s a Graphical Search Engine where you can set up complex search structures with morphology using boxes for very complex searches. You can save the GSE searches and tweak them later if you want. The GSE takes some time to learn and set up but it can perform some amazing searches. One of my favorite search features is called Fuzzy Search. This gives you results of similar words. 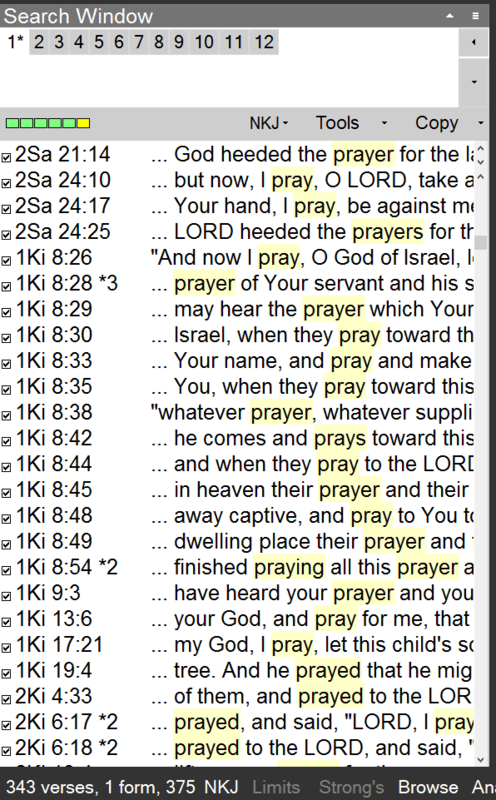 For example if you search for prayer you also get pray, prayed, praying, prayer, prayers, etc. About a decade ago I used the Franklin Bookman as my primary search tool because it did this type of search (it performed a different level of search every time you hit the search button – up to 3 times). 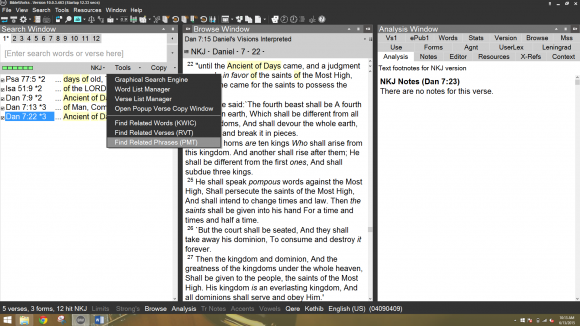 I’ve wanted this feature in Bible software ever since. BW10 knocked it out of the park. This greatly expands the use of using software for searching. I don’t know how many times I’ve had trouble finding a verse because I searched for the wrong tense of the word. Now it doesn’t matter because fuzzy searches will find every tense and similar word. Right click in the search window and select Fuzzy search option to turn it on. Once you turn it on, any searches you will use the fuzzy search feature. You can do Link based and Porter Stemming based fuzzy searches. Porter Stemming only does English versions. 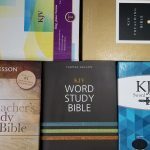 There’s also a word list manager and a verse list manager where you can generate lists of words and verses and do searches and various work with the lists. The copy features are also interesting. You can choose to copy the entire list, just what you’ve selected from the list, verses with or without text, etc. The copy function can also include a paste function if you want. 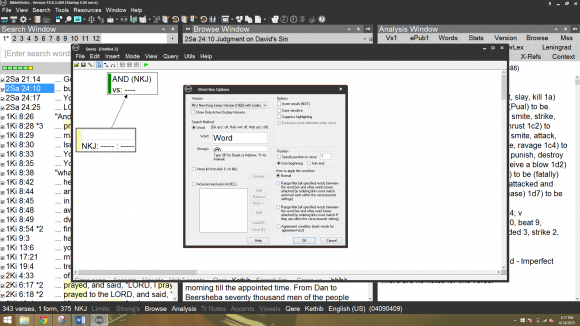 It will paste into the clipboard, Word, or BW editor (into the current editor or it can create a new editor). I use the search function a lot. For most of my searches I just use the . and type in the keywords that I want. I love that I can export the list into Word. This is a fine feature for sermon prep, class prep, and for personal study. You can close the search window if you want more room on screen for other windows. 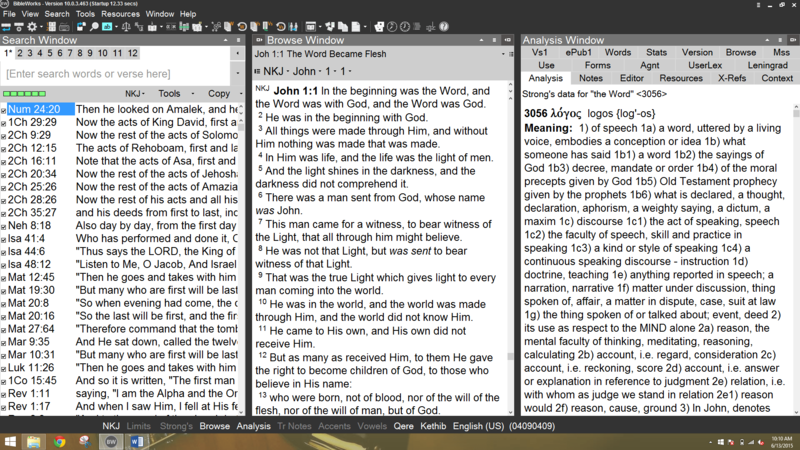 BibleWorks10 has a lot of comprehensive search features. You can create specialized searches, save them for later, expand the search with fuzzy searches, create visual searches with links using the graphical search engine, and then copy and paste the results. You can search in any language, including Greek, Hebrew, and Aramaic, and of course any translation you have installed. 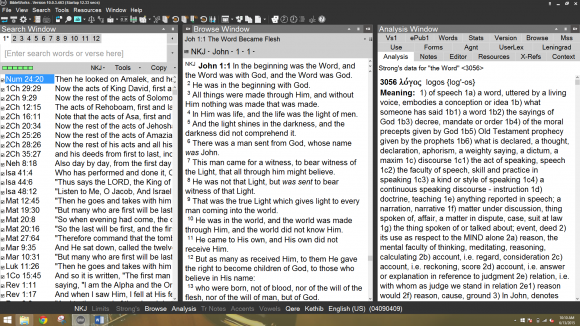 BibleWorks10 takes high-powered searching even further making it an excellent tool for sermon prep, class prep, and students. Stay tuned for part 2 where I take a look at the new features in the Browse Window and part 3 where I take a look at the new features in the Analysis Window. 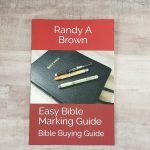 BibleWorks provided this software free for review. I was not required to give a positive review. My opinions are my own.